Neil Williamson is a resident of Glasgow, Scotland, and is the author of novels and short stories in genres ranging from science fiction to slipstream. 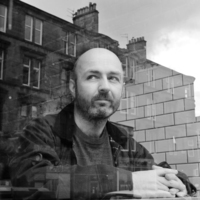 Several of his books and stories have been shortlisted for awards: Nova Scotia: New Scottish Speculative Fiction (World Fantasy Award), The Ephemera (British Fantasy Award), Arrhythmia (British Science Fiction Award), The Moon King (British Fantasy Holdstock Award and British Science Fiction Award, runner-up). Neil's latest book is: The Memoirist, a novella, to be published by NewCon Press in March 2017. To ask Neil Williamson questions, please sign up. Neil Williamson A space journey novella! Neil voted for The Ember Blade (The Darkwater Legacy #1) as Best Fantasy in the Opening Round of the 2018 Goodreads Choice Awards. We’d love your help. Let us know what’s wrong with this preview of Book of Dirt by Gretchen Heffernan. We’d love your help. Let us know what’s wrong with this preview of The Real-Town Murders by Adam Roberts. "‘Secret Language’ is a collection of short stories by Scottish born author, Neil Williamson. We’d love your help. Let us know what’s wrong with this preview of Thirty Years of Rain by Neil Williamson. An enthralling story that begins in gripping thriller mode and then takes you into the realms of the sort of science fiction that makes you pause with astonishment. An electrifying debut novel. We’d love your help. Let us know what’s wrong with this preview of Judgement by Fergus Bannon.